Having fought its last war in 1814, Sweden ended up one of the few European countries that avoided participating in either World War. Nevertheless, the Swedes always paid careful attention to their army's weapons. Despite its neutrality, Sweden often preferred weapons of German origin. This applied to tanks as well. Even the Strv fm/21, the first Swedish tanks, were really German LK.IIs. Ten of these tanks were built at AB Landsverk in Landskrona, which became the Swedish tank development center for decades to come. The Landsverk L-60 was born here, some elements of which were a real revolution for tank development in the 1930s. Sweden's neutral status, its developed industry, and well maintained connections were very useful for the Germans. The Treaty of Versailles prohibited Germany from developing new types of weapons and military vehicles. However, this prohibition did not stop the Germans from secretly re-launching tank development programs in 1925. They also did not miss out on the opportunity to develop tanks in other countries. German engineer Otto Merker began working at Landsverk in 1929. Two years before that, Merker was working as an engineer at Maschinenfabrik Esslingen AG, and designed a tractor that the German military was very interested in. Taking a tractor as a foundation for his design, Merker ended up with a chassis that was appropriate for a convertible drive tank. Building the tank was his reason for coming to Landsverk. By that time, the company was under the control of Gutehoffnungshütte, Aktienverein für Bergbau und Hüttenbetrieb (GHH) from Oberhausen. Only a few dozen kilometers separated Oberhausen and Hessen, the capital of Krupp's empire. By coincidence, Krupp owned about a third of the stock of Bofors, a Swedish arms company. As for GHH, it was directly connected to the MAN conglomerate, another German tank development powerhouse. The Landsverk 60 project initially looked like this. Blueprint S.128, October 22nd, 1931. The result of Merker's work was the Strv M/31 (Landsverk L-10), the first domestically designed Swedish tank. However, a careful look at the tank reveals its origins. To start, the Strv M/31 used the Maybach DSO 8 engine, the same engine as was later chosen for the Rheinmetall B.W. (Begleitwagen) support tank project. The 37 mm Bofors gun also drew its origins from Germany. Take a close look at the turret. Similarities to the Leichttraktor Krupp and Leichttraktor Rheinmetall are evident. Meanwhile, the L-10 did not entirely satisfy the Swedes. A simplified variant of the convertible drive Landsverk L-30 (Strv fm/31), this tank had a complicated suspension, and was not exactly cheap. Three units were built, and further work stalled. The financial crisis that raged on in Europe hit Sweden fairly strongly. Unemployment in 1933 hit 25%. The only hope for the Swedish tank industry was in exports. 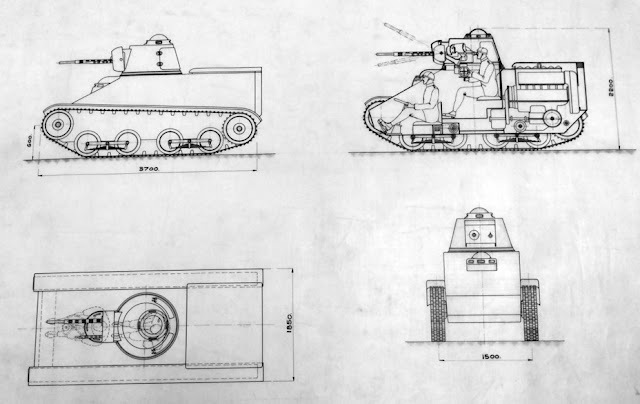 Design work at Landsverk sped up, and the Swedes "drew" many tanks. The hero of this article started out on one of these blueprints. The index Landsverk 60 was first used in the end of October of 1931. Blueprint S.128 showed a two-man scout tank armed with a 20 mm automatic Madsen gun and a coaxial machinegun of the same brand. The 100 hp Mayback OS-5 was used as the powerplant. The result was a decent alternative to the German Kleinetraktor, otherwise known as the La.S, which was currently being designed by Krupp. Even though the Swedish tank turned out a lot better, the Germans paid little interest to the project. The Landsverk 61 was a further development of the idea. Blueprint S-138, November 1st, 1932. 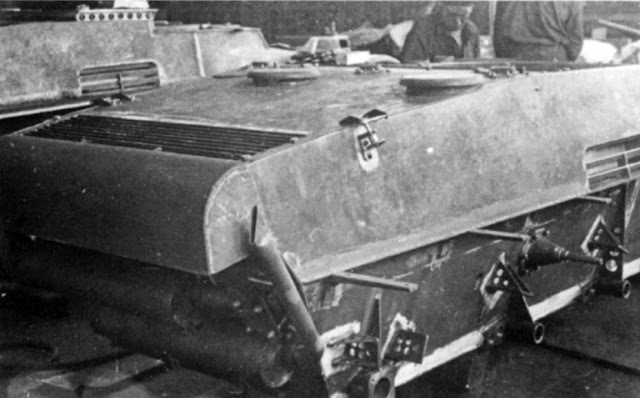 The technical characteristics of this tank were obtained by Red Army intelligence. The Landsverk 60 project was shelved, but not for long. A year later, in early November of 1932, an improved version of the tank was designed, indexed Landsverk 61. The mass grew to 5.5 tons, as did the size. The turret was more reminiscent of the Landsverk L-10 turret, but it still only housed one person and the Landsverk 60's armament. The transmission was moved to the front of the hull. Clearly, this move was inspired by information about trials of the Kleinetraktor on the Carden-Loyd chassis. Even though this tank, like its predecessor, remained in paper, its fate was more fortunate. The Landsverk 61 project was actively marketed abroad, and it was noticed by Soviet intelligence in 1934. According to reports, Soviet specialists considered this tank useful as a reconnaissance vehicle and partially as a tank destroyer. The firepower of the 20 mm Madsen gun was sufficient for most tanks of the time. Ireland was also interested in the tank. Its military considered the Landsverk 61 suitable for its defense doctrine, which called for a light vehicle with an automatic cannon and at least 20 hp/ton. This was the next stage of the Landsverk 60's evolution. This was the variant that the Irish ordered. 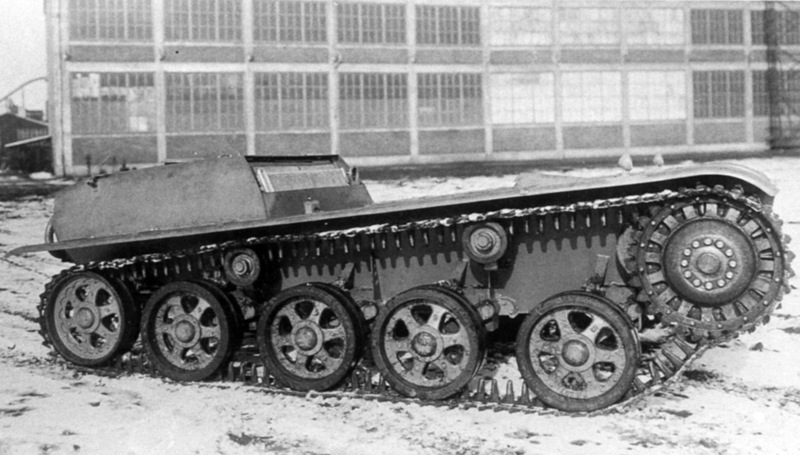 In January of 1934, a new variant of the Landsverk 60 was ready. 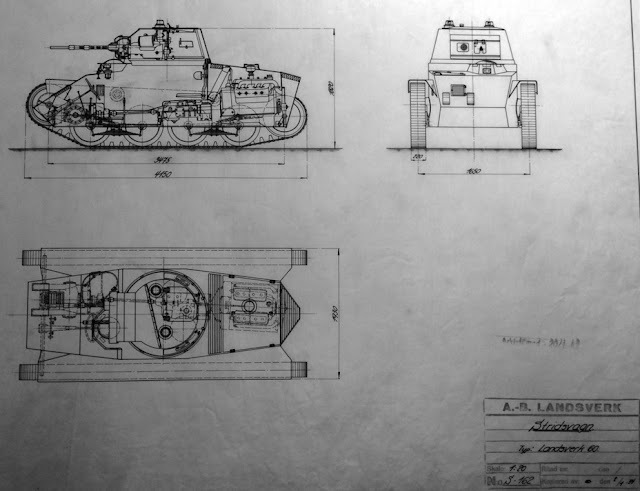 Blueprint S-162 showed a vehicle that was a reworked Landsverk 100 scout tank. The length of the hull grew to 4100 mm, and its width to 1930 mm. The turret became a two-seater, while maintaining its original armament. The engine also changed. Merker decided to use the V-shaped 8 cylinder 160 hp Büssing -NAG L8V-G engine. This was the variant that Ireland noticed, signing an agreement for delivery of two tanks of this type in May of 1934. However, this was only the beginning. The agreement between Landsverk and the Irish defense ministry to produce two prototypes of the tank, indexed Landsverk L-60, did not mean that work on the tank was done. Merker continued the design process. It is also worth remembering who stood behind the Swedish company. The ample use of German components implies that the tank doubled as a test lab. One of the technical solutions first used on the L-60 forever cemented its place in the history of tank development. One of the several parents by Karl Rabe for a torsion bar suspension. In the early 1930s, Karl Rabe, the right hand of Ferdinand Porsche, began development of a radically new automotive suspension. Instead of leaf or coil springs, the design used torsion bars. Technologically, the torsion bar is more complicated than a spring, but the design saves a lot of space. By 1933, Rabe perfected his suspension. It was proposed to test it on the La.S, but the proposal never reached implementation. Cutaway of the reworked L-60. You can see that little remains from the previous iteration. A completely different fate awaited the torsion bar suspension in Sweden. 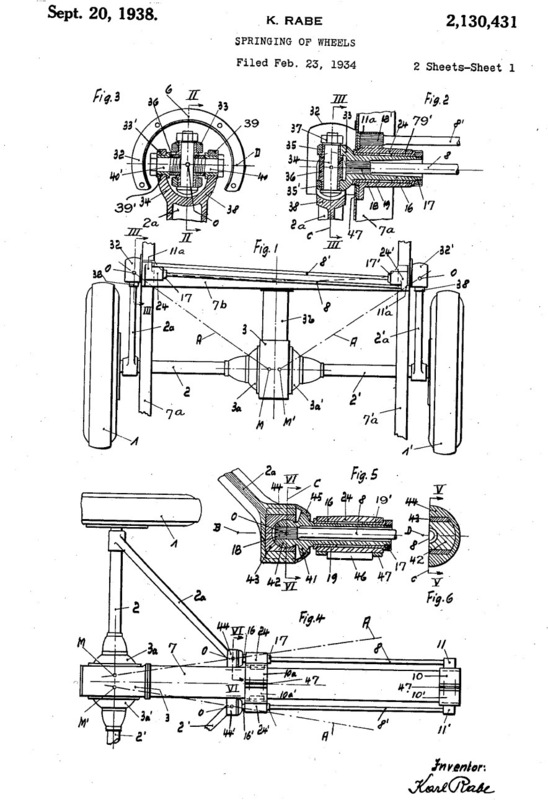 In 1934, Merker redesigned the L-60 to use a torsion bar suspension. The hull had to be lengthened by half a meter, which only improved the vehicle. The extra length was added to the engine compartment, which was initially very small, small enough to cause overheating issues. The tank received Landsverk L-10 type road wheels and idlers, but the drive sprockets became different. The idler was lowered, which increased the contact surface. Assembly of the L-60 for Ireland, 1935. As a result, the only parts that remained from the original were the turret, engine, and overall layout. The cost of these changes was that the Landsverk L-60 prototype was only ready a year later. Both of the Irish L-60s were finished by August of 1935. The 7 ton tank could achieve a speed of 45 kph. The power to weight ratio was even higher than required: 22.8 hp/ton. The armament was also good for its time. The workings of the suspension can be seen in this photograph. That August, the vehicle was demonstrated to a commission headed by Major A.T. Lawlor, head of the Irish armoured corps. The Irish delegation was pleased, aside from one not so minor detail. During the demonstration, an error by the driver caused a fire in the engine, which spread to the entire vehicle. The tank burned to a crisp, and Landsverk had to foot the bill for a replacement. The Swedes knew that Ireland could not afford many tanks and kept looking for more customers. In the fall of 1935, a Swiss delegation arrived to observe the tank trials. An order for six L-60s and the lighter L-120 loomed on the horizon, but it was not to be. Having tried out the Swedish tank, the Swiss chose another vehicle, the Czechoslovakian LTH, sighing a contract with CKD on April 17th, 1936. The LTH was perhaps not as technologically progressive, but it was a better fit. Swiss commission testing the first L-60, fall of 1935. As for the tank they tested, it finally arrived in Ireland in November of 1935. The second tank took another year. No orders followed for a very simple reason: Ireland's defense budget was quite small. Both of Ireland's Landsverk L-60 on maneuvers. The tanks received designations L-601 and L-602. They were assigned to the 2nd Armoured Sqadron with a Vickers Medium Tank Mk.C. 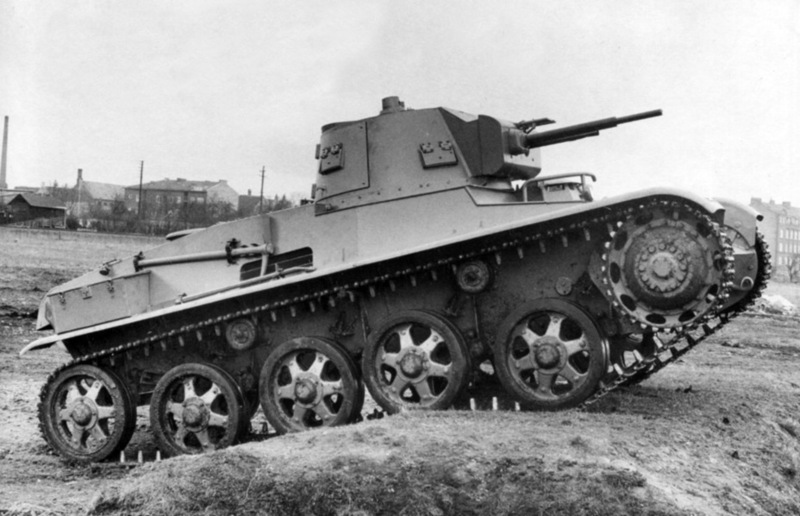 Unlike the clumsy British tank, the quick Swedish vehicles were beloved by Irish tankers. The L-60s remained in the Irish army until 1953, when they were demobilized due to wear and a lack of parts. Both tanks were preserved until present time. In December of 1936, the Swedes received another order for an experimental tank. This time the customer was Austria. The slightly redesigned tank received the index Landsverk L-60Ö (Österrike, or Austria). Overall, the vehicle changed little, and its length only grew by 6 cm. The design of the drive sprocket was changed: it became a lot easier to take off the crown. The armament was also changed, incorporating the Austrian 8 mm caliber. By that time, Otto Merker left Sweden, and Wilhelm Buchegger (another German) became Landsverk's chief engineer. Landsverk L-60Ö on trials, April 1937. The Poles also tried out the tank. This photo shows the different drive sprocket. 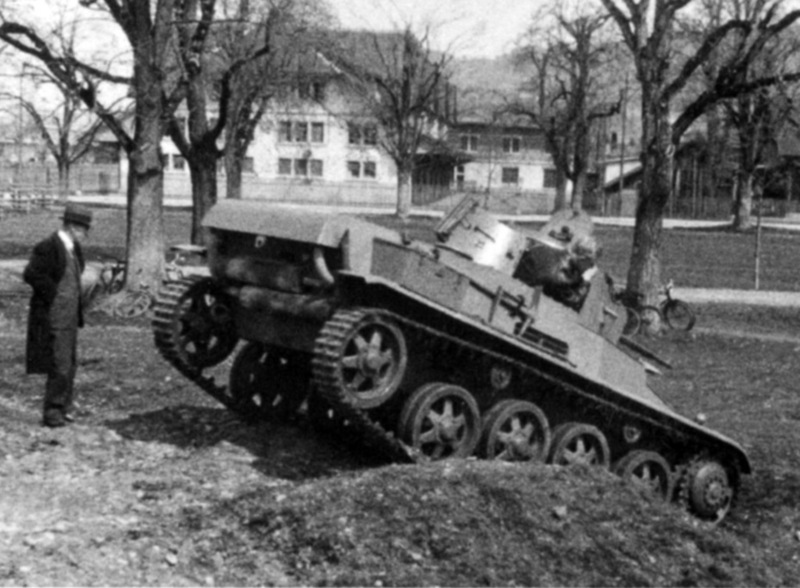 The Landsverk L-60Ö was ready by late March of 1937, but the Austrians rejected the tank. It didn't take long for a new client to show up. A Polish delegation was greeted in Landskrona on April 21st. The Poles were interested in a wide spectrum of Swedish armoured vehicles. Aside from the L-60, they had their eyes on the lighter L-120, and the L-135 artillery tractor. The Poles tested tanks over the course of a week, but a deal was not reached. 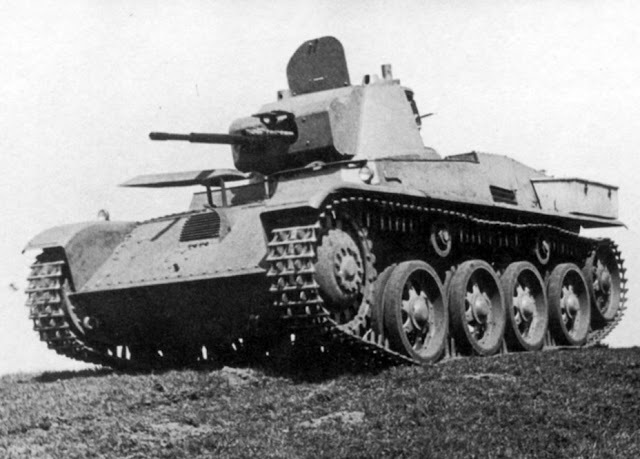 Poland was already producing the 7TP, a Polish variant of the Vickers Mk.E. Overall, the Polish and Swedish tanks were equal, so the decision to reject a foreign tank in favour of a domestic one is reasonable. Interestingly enough, the Poles already built a 7TP with a Bofors turret and a 37 mm gun from that same company. In 1937 that turret was put into mass production, surpassing the L-60 in firepower. Converted Landsverk L-60Ö. This variant was sent to Hungary. Third time was the charm for the Swedes. Hungary became interested in their tank. Talk of an order began in October of 1936, when the Hungarians were offered, in addition to the L-60, the L-62 SPAAG and L-181 armoured car. The armoured car was rejected, but the history of the L-62 is worth its own article. As for the L-60, it was sent to Hungary after the Poles tested it. Here, the Swedish tank was tested against the Pz.Kpfw.I Ausf. A and the Hungarian convertible driver Straussler V-4. The German light tank fell out of the competition early, and Straussler's design proved too complicated. Another advantage of the L-60 was that its engine, produced in Germany, was easily available. The Swedish tank was chosen, and it was adopted into service as the 38M Toldi. 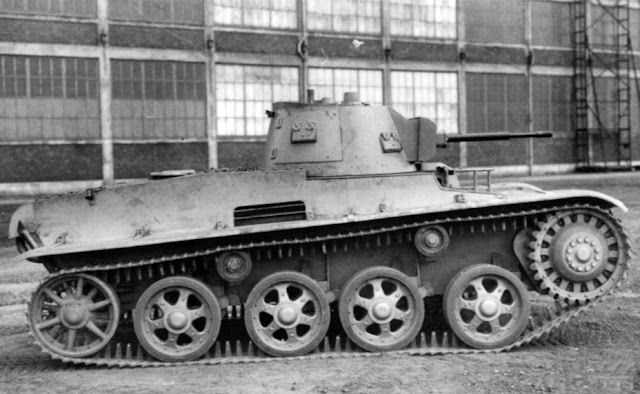 An improved version of the tank began production in April of 1940 at the Ganz and MAVAG factories in Budapest. As odd as it sounds, the Swedish army was among the last to express interest in the new tank. 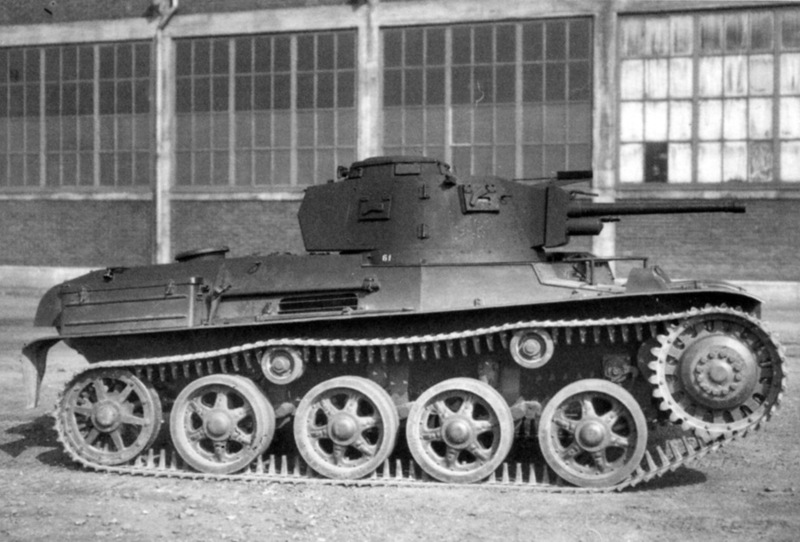 At the time, the Swedish government was seriously considering the Vickers Mk.E, especially since Landsverk's domestic production stalled in the early 30s, and the tanks they did make were of questionable quality. Price was also a major factor. Interest in the tank was first shown when the first sample was sent to Ireland. On April 7th, 1936, a Swedish military commission headed by Captain Eric Gillner, the head of artillery development, visited Landsverk. The commission was shown technical documentation. The military was interested in the torsion bar suspension, but treated the 20 mm autocannon skeptically, considering the 37 mm Bofors gun, used on the L-180 and L-181 amoured cars, more suitable for a tank. The idea of using a domestic engine if the tank would be used by the Swedish army was also born. On July 17-20th, a demonstration of mobility was made with the second L-60 built for Ireland. The tank was compared with the L-10, making a trip from Landskrona to Halmstad and back. Off-road trials were also performed. The tank surprised the observers by its performance on and off the road, as well as its optics. 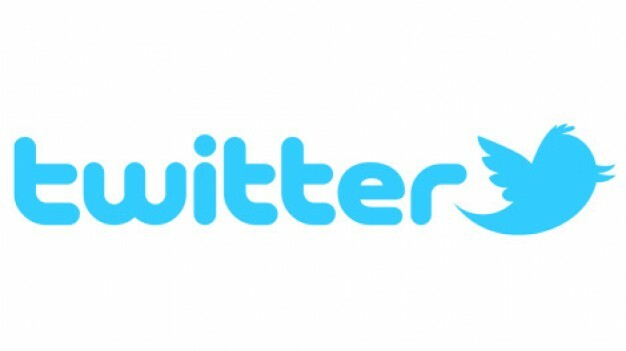 However, the commission remarked that the suspension needs improvements. 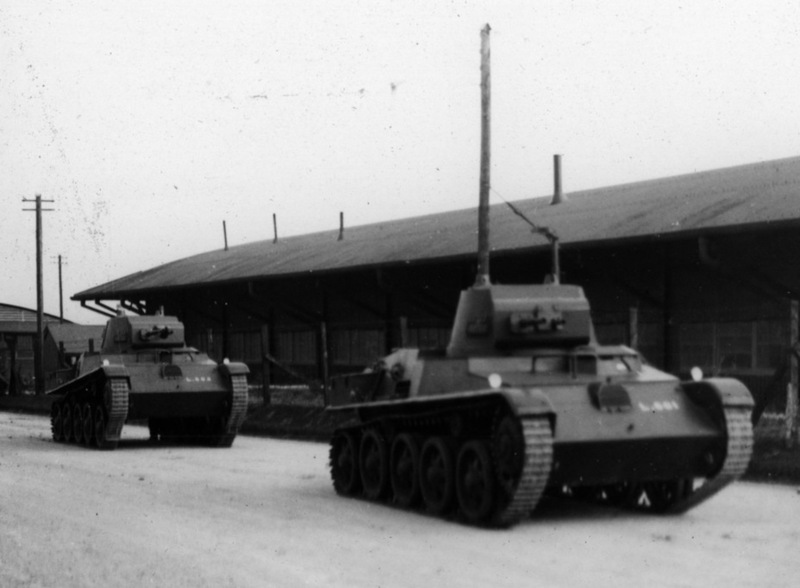 In July of 1936, the Swedish army finally issued an order for two experimental tanks. 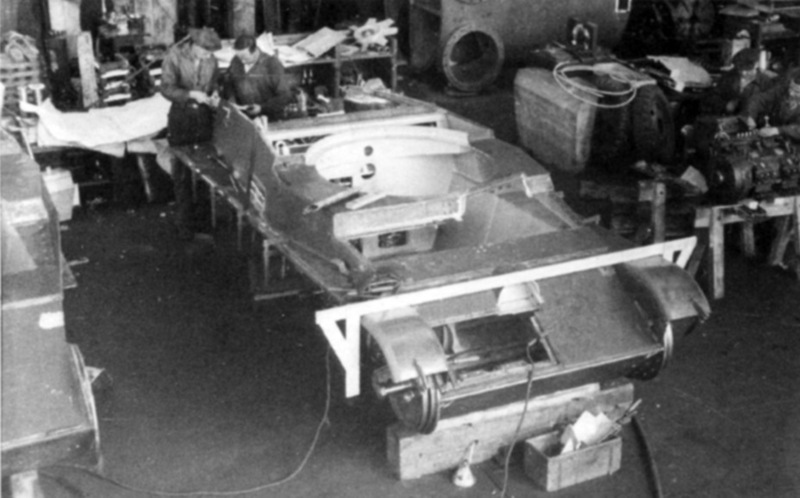 The first, serial number 61, was only a chassis. The second, #62, was a complete tank. Tank #62 will be featured in the next article on Swedish tanks. However, here it's worth mentioning that it was built with a 20 mm Madsen gun, and not a 37 mm Bofors gun. A whole journey dealt with the armament of this tank. Alternative armaments were also explored, like the 20 mm Solothurn anti-tank rifle and an experimental Bofors 37 mm autocannon. In April of 1937, design work began, which were inconclusive. Both the Solothurn and Bofors guns took up too much space in the turret, making the use of a coaxial machinegun impossible. Work on this topic ceased. Both tanks were ready by August of 1937. Trials were performed from August 9th to 18th. As specified in the requirements, instead of Büssing-NAG L8V-G engines they used domestically produced 142 hp Scania-Vabis typ 1664 engines. The length of the hull grew to 4.8 meters. The mass of chassis #61 was 6100 kg, and the mass of tank #62 was 8215 kg. As the result of trials, a decision was made on September 10th, 1937, to order 15 tanks for the army. These tanks received a factory index L-60S and army index Strv m/38. A list of additions and changes for chassis #61 was also made. By 1938, the chassis became a full tank with a new turret, featuring a full bustle and a 37 mm Bofors m/38 tank gun. It had a coaxial ksp 8 mm m/36 strv machinegun, a Swedish variant of the American Browning M1917A1. The turret, like tank #62, received a cupola with many observation devices. After additional trials, tank #61 became the first tank from a series, shipments from which began on August 25th, 1938. Converted tank #61, the first mass produced Strv m/38. At the time of its creation, the Strv m/38 was one of the best tanks in its class. Of course, by 1938, 13 mm of armour was clearly insufficient, but experience from the Spanish Civil War was just being processed by designers. The Swedish tank had high performance and smooth travel provided by the torsion bar suspension and a good gun, capable of fighting most tanks of the time. 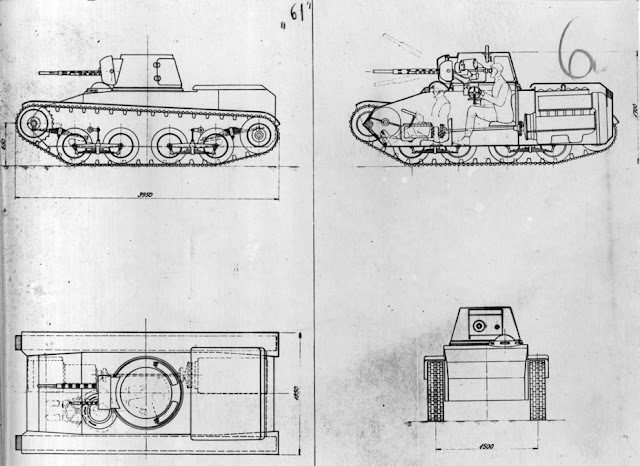 The ideas that founded this tank allowed further development, but more about that in a later article.